Cask; Regular. Also available bottled - microfiltered but not pasteurised (bottled by Thwaites). 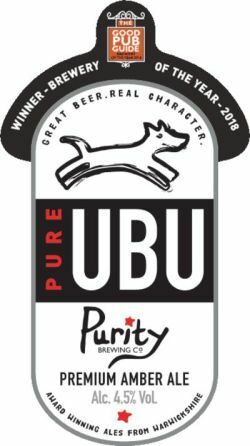 Pure UBU is a distinctive, full flavoured beer with a sweeter finish and dark fruit notes. Brewed with English Maris Otter, Crystal, Black and Wheat malts, with Pilgrim and Cascade hops with an IBU 36. Color amarillo corona de espuma blanca, aromas maltosos, sabor maltosa motas florales cuerpo medio. UPDATED: NOV 14, 2018 Cask ale at JDW Last Post, smell is redolent of long summer evenings, not really, it actually just smells like beer. A hypnotic blend that hits the taste buds like napalm on a rain forest. Didn't think much of Per Ubu the musical act from the 70s but I quite like this beer. Echo Beach, far away in time. UPDATED: OCT 30, 2018 Bottle, 500 ml. Typical British bitter with a hint of fruity character cz of Cascade. Hazy dark amber/light copper with decent beige foam. Nose is caramel with a noticable fruity character like peach or orange. Palate is thin a bit, mainly biscuit and caramel with a good bitterness on the end. Fair bitter, but not as good as the Mad Goose. UPDATED: JUL 17, 2018 Bottle. Pours a beautiful auburn colour with a lasting fluffy cap and lacing on glass. Aroma is disappointing, rather metallic. Taste is nice enough though, decent malts dominate, then a gentle spice and subtle hoppiness leading to a lingering bitter taste in the finish. It’s ok. Bottle from Tesco. Aroma mostly piney with a touch of citrus. Head thin but lacey. Flavours follow the nose, nice malts balanced against that piney note. A bit different and interesting. Nice. 500ml bottle from Sainsburys, Chertsey. Amber colour with white head. Sweet bready malt, grapefruit, bready, floral, light soapy, biscuit cracker, light green apple. More of a bitter than an amber ale. Malty with sweet caramel flavours, a little fruit, plum and raisin, biscuit. Dark Amber, cream head. Ok, old school bitter.